Hammerworks Antique Wooden Chandelier CH202 is completely handmade to order. This handsome two tier, 12 arm model in our collection of Colonial Wooden Chandeliers is sure to impress! First of all, we use select hardwoods to turn each Early American Reproduction Wooden Chandelier individually. Furthermore, we hand form the antique tin or antique brass arms one at a time. 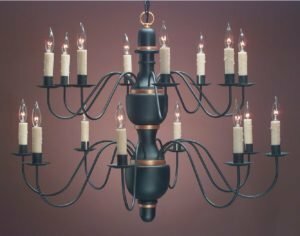 Finally, we provide a variety of finish selections to paint or stain each Antique Wooden Chandelier to your exact specification. Consequently, this allows you to match the wood chandelier to your color scheme. In terms of practical information, the following applies to every vintage wooden chandelier. We provide 2 feet of matching chain and a ceiling canopy for each fixture. In addition, each chandelier arm is rated for a maximum of 60 watts per socket. As a result, you can be sure that there will be sufficient light no matter where you place your custom wood chandelier. Our Colonial Ceiling Lights go hand in hand with any of the Antique Wooden Chandeliers. For original antique Colonial homes with low ceilings, consider Antique Tin Ceiling Lights as the perfect solution. The tin ceiling light is also available in either antique brass or antique copper finish. In addition, we offer two styles of punched tin ceiling lights. Either one of these pierced ceiling lights adds charm and ambiance to any space. Of course just as with vintage wood chandeliers, we make our Colonial ceiling lights completely by hand, with attention to detail. Also, we offer a variety of style and finish options. In terms of illumination, we equip most of these fixtures with 2 medium base sockets, rated for a maximum of 60 watts. Pierced Tin Ceiling Lights CL116 are the exception, having one medium base socket also rated for a maximum of 60 watts.